Drawing together nearly 40 years of experience, Museums without Borders presents the key works of one of the most respected practitioners and scholars in the field. Through these selected writings, Robert R. Janes demonstrates that museums have a broader role to play in society than is conventionally assumed. He approaches the fundamental questions of why museums exist and what they mean in terms of identity, community, and the future of civil life. This book consists of four Parts: Indigenous Peoples; Managing Change; Social Responsibility, and Activism and Ethics. The Parts are ordered chronologically and each begins with an introduction and an overview of the ensuing articles which situates the papers in their historical and cultural contexts. Using an interdisciplinary approach that combines anthropology, ethnography, museum studies and management theory, Janes both questions and supports mainstream museum practice in a constructive and self-reflective manner, offering readers alternative viewpoints on important issues. Considering concepts not generally recognized in museum practice, such as the Roman leadership model of primus inter pares and the Buddhist concept of mindfulness, Janes argues that the global museum community must examine how they can meet the needs of the planet and its inhabitants. 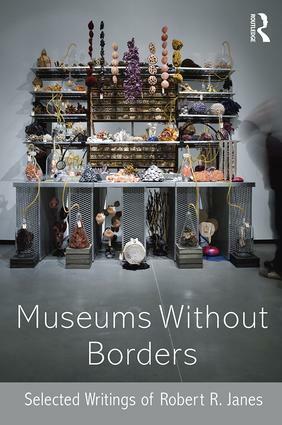 Museums without Borders　charts the evolving role of the contemporary museum in the face of environmental, societal and ethical challenges, and explores issues that have, and will, continue to shape the museum sector for decades to come. This book demonstrates that it is both reasonable and essential to expand the purpose of museums at this point in history – not only because of their unique characteristics and value to society, but also because of Janes’ respect and admiration for their rich legacy. It is time that museums assist in the creation of a new, caring, and more conscious future for themselves and their communities. This can only be done through authentic engagement with contemporary issues and aspirations. 13 What Will Communities Need and Want from Museums in the Future? 17 Museums: Stewards or Spectators? Robert R. Janes is an independent scholar and served as editor-in-chief of the Journal of Museum Management and Curatorship from 2003 to 2014. He has worked in and around museums for 39 years as an executive, consultant, editor, author, board member, archaeologist, instructor, volunteer, and philanthropist. Janes has devoted his career to championing museums as important social institutions that are capable of making a difference in the lives of individuals and their communities. He began his career as an archaeologist in Canada’s remote Northwest Territories and continues to work with Canada’s indigenous peoples. He was given a traditional Blackfoot name in 1995. In addition to his museum work, Janes is the co-owner of a permaculture farm and orchard in British Columbia (Canada). 2003 - A Conversation with Robert Janes. Edited by Ken Tingley, Alberta Museums Review, Vol. 29, Issue 1, Fall, pp. 11-28. 2009 - “It’s a Jungle in Here: Museums and Their Self-Inflicted Challenges”. In Museums in a Troubled World [link: https://www.routledge.com/products/9780415463010] by Robert R. Janes. London and New York: Routledge, pp. 57-93. 2011 - “Museums and the End of Materialism”. In The Routledge Companion to Museum Ethics: Redefining Ethics for the Twenty-First Century Museum [link: https://www.routledge.com/products/9780415566124], edited by Janet Marstine, London and New York: Routledge, pp. 54-69. 2015 - “The Blackfoot Repatriation: A Personal Epilogue”. In We Are Coming Home! Repatriation and the Restoration of Blackfoot Cultural Confidence. Edited by Gerald T. Conaty, Athabasca University Press, Edmonton, Alberta, Canada, pp. 241-262. All material is reproduced with the kind permission of the original publishers.